Okay, let’s make something out of nothing. Even when I think there’s nothing in the veggie drawer, I have carrots. No, not the cute small ones with perky green tops still attached; I’m talking the big-uglies, pulled from the 5 lb. bag that has probably been sitting there for half of the winter, the kind of carrots that are over-looked, but if you scrub ’em up, peel and roast them, will surprise you with their sweet, earthy flavor. What else can I find? Half of a red onion, part of a lemon, a few sprigs or rosemary, a small bunch of parsley that I should put to use before it’s too late, and a stubby piece of Parmesan. Okay, to the cupboard. A can of cannellini beans and a bag of quinoa. We can work with this. Turn the oven on and get some water boiling for the quinoa. 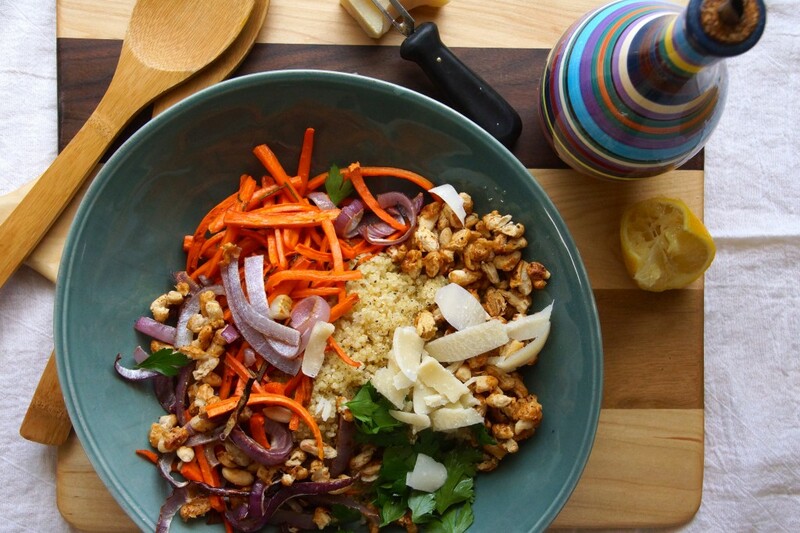 We’re going to roast the carrots and onion and toss them with the quinoa. Hmm, what about the beans? Let’s roast those, too, and see if we can use them as our crunch element. Excellent! The beans got super crisp and our carrots went from sad to vibrant. The onions are charred here and there, just the way we like. 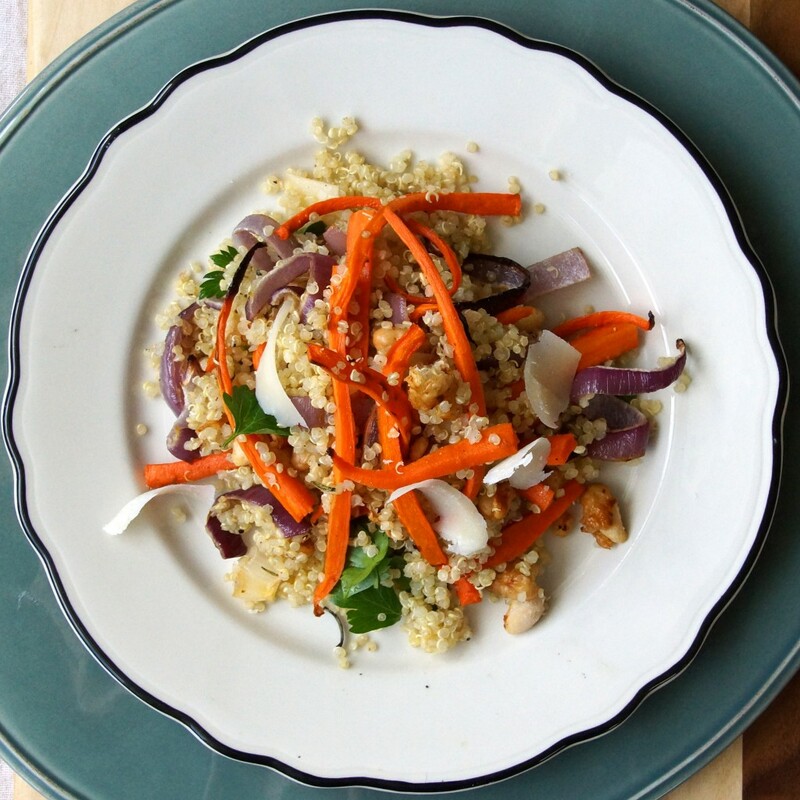 Toss the resuscitated carrots and the roasted onion with the cooked quinoa. Add the beans, parsley leaves, and curls of Parmesan. Drizzle with olive oil, season, and squeeze a wedge of lemon over the top. Done! Lunch is served, I’m out of my hunger-stupor, and I’ve got another go-to healthy, colorful salad in my gotta-make-something-outta-nothing repertoire. Crisis averted. 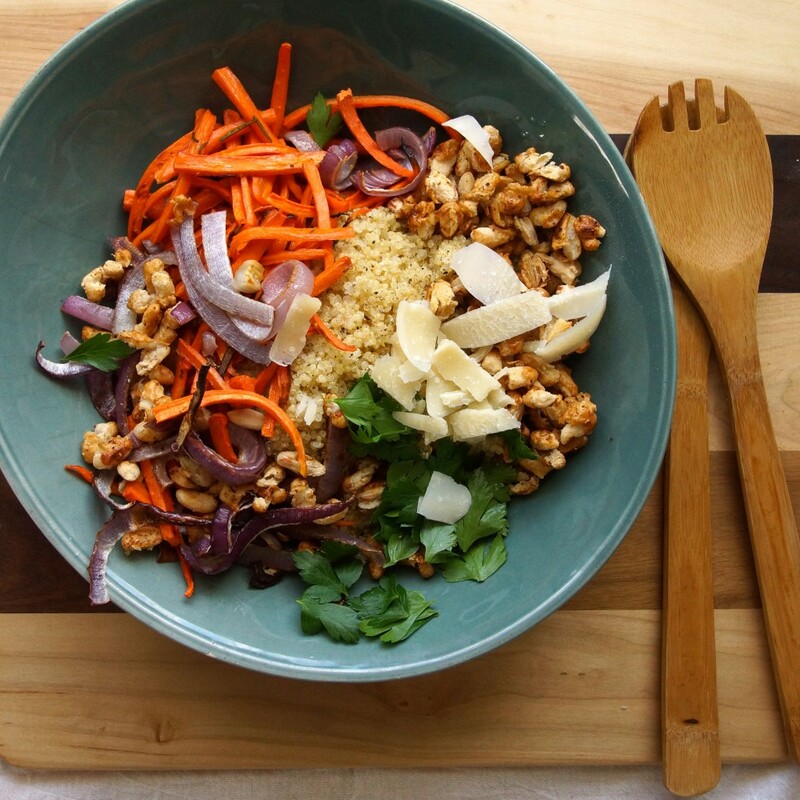 When all else fails, I can almost always count on having a bag of carrots in the veggie drawer and a can of beans and quinoa in the cupboard and being able to throw together this healthy, colorful salad. 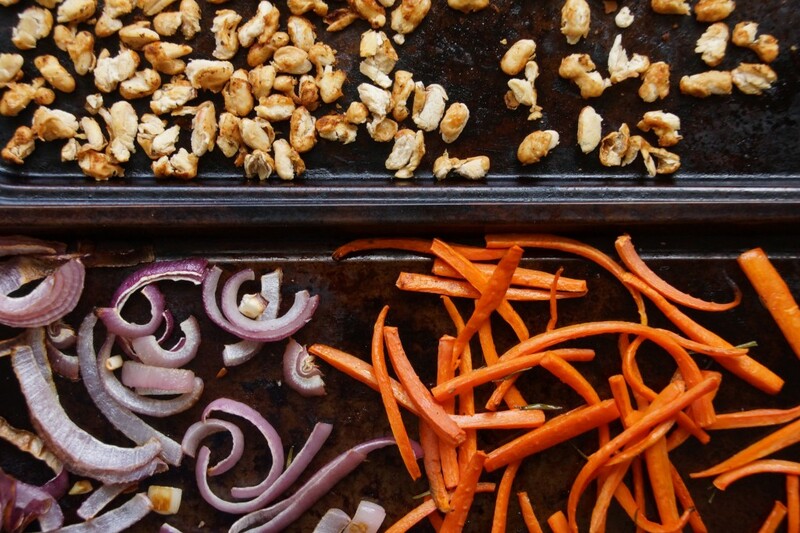 On a baking sheet, toss carrot sticks and onion slices with olive oil, salt, pepper, and rosemary. Roast until the vegetables are tender and lightly browned in spots, 25-30 minutes. On a separate baking sheet, toss the cannellini beans with olive oil, smoked paprika, and salt. Roast until the skins split and the beans are golden and crisp, about 20 minutes. Stir once or twice while they are roasting to prevent any sticking. Meanwhile, bring 2 c. water to a boil. Salt and add the quinoa. Reduce heat to a simmer, cover, and cook until tender, 10-12 minutes. If any liquid remains, drain it off. 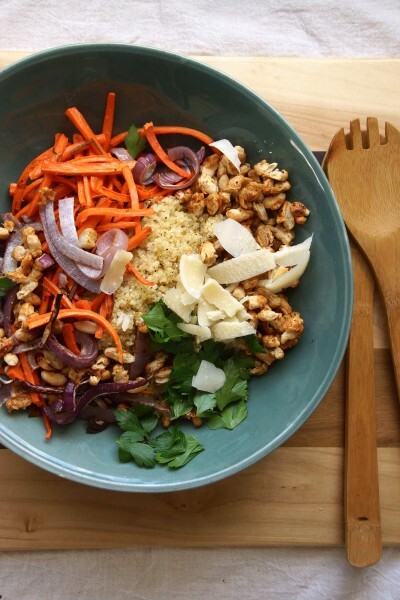 Combine cooked quinoa, roasted carrots and onions, cannellini beans, and parsley leaves in a large salad bowl. Dress lightly with extra virgin olive oil, fresh lemon juice, and freshly ground black pepper. Toss gently. Using a vegetable peeler, make curls of Parmesan to garnish the salad. The salad can be served still warm or at room temperature. 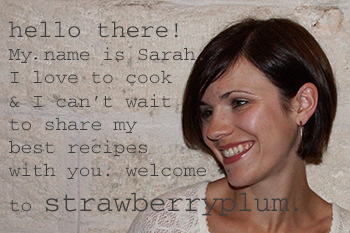 Hi Sarah, thanks for leaving a comment on my blog a while ago – I’ve been checking out your site and I really like your Italian style of cooking. I also totally transport myself to beautiful places (err.. Rome, Paris..) by the food I cook. But girl, you’ve got to watch Star Wars! 😛 The originals, not the new ones. I prepared this fabulous salad tonight and it was nothing short of spectacular! I added a little chopped red cabbage for extra crunch, some lime zest and toasted pine nuts (because I love them). My husband agreed this was super yummy! Your photos and instructions made it all very easy for me to prepare in a jiffy. Thanks so much for sharing your amazing amazing recipes. You are sugar and spice and everything nice! Sunday, I’m so glad you and your husband liked the salad and those sound like some very tasty additions!